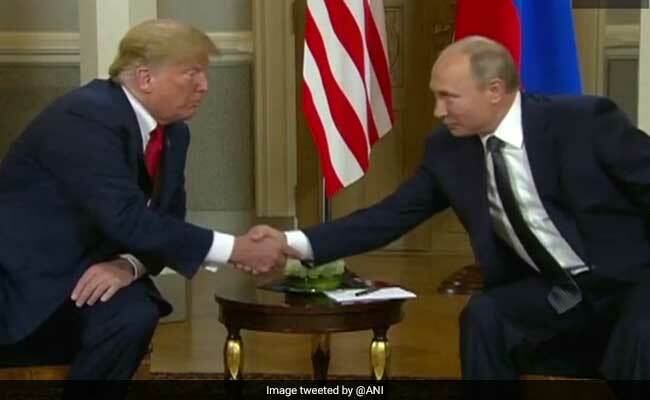 United States President Donald Trump and Russian President Vladimir Putin on Monday met in Finland's capital Helsinki. Mr Trump said during the meeting that the United States and Russia would have an extraordinary relationship. This was after he tweeted earlier that Washington's "foolishness and stupidity" was the reason for bad relations. The Russian foreign ministry "liked" Mr Trump's comments on Twitter ahead of the summit. "Our relationship with Russia has NEVER been worse thanks to many years of U.S. foolishness and stupidity and now, the Rigged Witch Hunt!" Donald Trump wrote on his Twitter account. Vladimir Putin said: "The time has come to talk in a substantive way about our relations and problem areas of the world." Donald Trump said: "And I really think the world wants to see us get along. We are the two great nuclear powers. We have 90 percent of the nuclear, and that's not a good thing. That's a bad thing." Donald Trump congratulated Russian President Vladimir Putin for his country's semi-final run in football world cup. He said,"I would like to congratulate you on a very great world cup, one of the best ever".